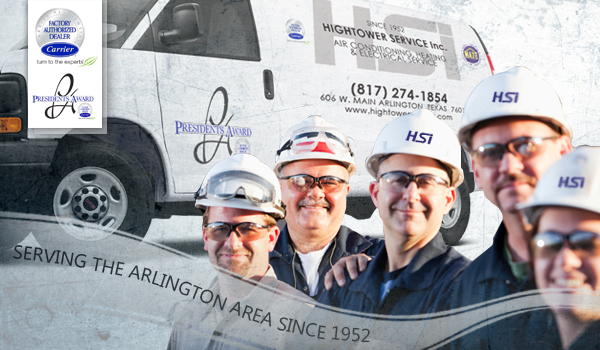 Hightower Service, Inc. has been serving the Arlington Texas Area since 1952. HSI is a proud Carrier Factory Authorized Dealer and a President’s Award winner. We service all makes and models of equipment both residential and commercial. HIS is not limited to just HVAC, we offer a complete electrical service department. This allows us to offer more services and assistance to our customers. The next time you need a full service HVAC or Electrical Company, give Hightower Service, Inc. a call. Our mission from the beginning is to provide our customers with the best professional service in the industry. We know our company is only as good as our employees. That is why we retain all of our employees throughout the year. This gives HSI a more consistent workforce, which is an advantage to the customer. We thank you for the opportunity to serve you and look forward to establishing a long relationship with you.